Spain's Prime Minister Loses Confidence Vote, Ushering In Socialists : The Two-Way Prime Minister Mariano Rajoy was voted out of office by an absolute majority of Spain's parliament after a former treasurer of his party was found guilty in a bribery and money-laundering scandal. Spanish Prime Minister Mariano Rajoy (center) arrives for a vote on a no-confidence motion at the lower house of the Spanish parliament in Madrid on Friday. 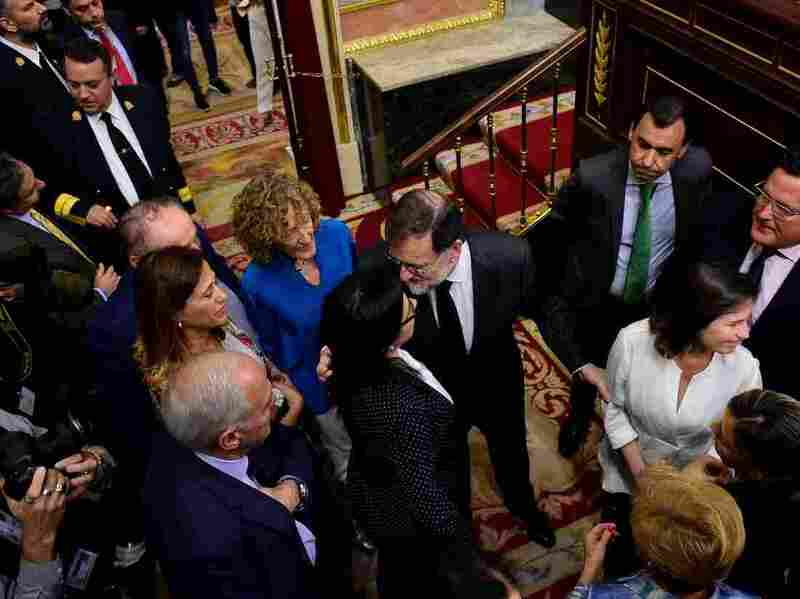 Following the vote, Rajoy shook the hand of the leader of the Socialists, Pedro Sánchez, who is all but certain to become the next prime minister. Sánchez received a standing ovation in Parliament as members of his party chanted "yes, we can!" The position of Rajoy, 63, became untenable after Spain's High Court found Luis Bárcenas, a former treasurer of the prime minister's People's Party, guilty of receiving bribes, money laundering and tax crimes. Bárcenas has been sentenced to 33 years in jail. In a brief farewell ahead of the vote — the first successful no-confidence motion in Spain's four decades of democracy — Rajoy said, "It has been an honor to leave Spain better than I found it." "Thank you to all Spaniards and good luck," he said. Nearly a year ago, Rajoy survived a similar no-confidence vote, according to El País. "Why should I have to resign, if for now I still have the trust of the house, and the trust awarded to me at the ballot boxes? You're the one who should be resigning around here," said Rajoy, addressing Sánchez. "Mr Sánchez said that if he gets into power he would stick to the 2018 budget negotiated by Mr Rajoy, so there will be no instant policy shifts. He says he wants to implement reforms in some areas, for example on salaries, pensions and gender equality. "He has also said that he wants to re-establish a dialogue with the pro-independence government of Catalonia, which has broken down in recent years, possibly indicating a more accommodative approach to the ongoing constitutional crisis in the region."